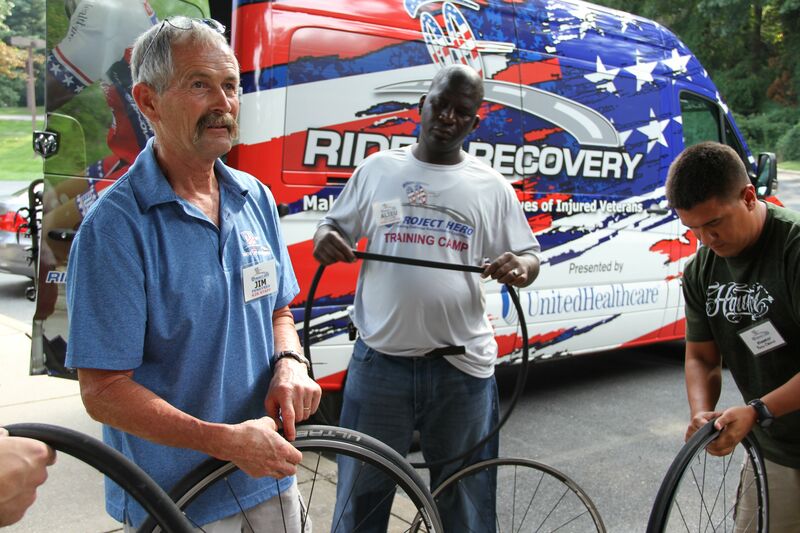 Thirty-three representatives from Warrior Transition Units, Wounded Warrior Battalions and Veteran Affairs (VA) medical clinics came to Bethesda, Md., recently to participate in a three-day training camp to build and improve their respective Ride 2 Recovery cycling rehabilitation programs. Project HERO (Healing Exercise Rehabilitation Opportunities) is designed as a train-the-trainer camp, where vital cycling skills such as organizing and leading rides, bike mechanics, maintenance, adaptations and safety and even bike building and fitting are taught to hospital and military representatives. Project HERO National Director Barbara Springer said the camp aimed to empower local cycling representatives so they can promote a fuller, quicker rehabilitation for injured servicemen and women. Army veteran Marina Libro is developing a Project HERO cycling program with the McGuire Veterans Hospital in Richmond, Va. For her, learning how to fit riders for a bike and seeing how a maintenance shop was set up was the most useful elements of the training.